My brother was a recipient of that chain email I talked even though he did not join he did send me a recipe. He was an inspiration to me working at Danny Kay’s that small Italian restaurant in Falmouth long since gone, making sauces and other delights. I remember walking in when I moved back to the cape from Chicago (at least 3 years had passed) and Paula Rose asked me if I wanted my usual Veal parmesan. It was the kind of place that you could share stories and sometimes food with people sitting next to you at least my Dad did. I think that is why I can make new friends in a line. Sorry, but I am not into the mass recipe things. But I would like to share this wonderful treat. The problem is that it is really not very good for those on a diet. But it is unbelievably yummy. Once made, it can be frozen and saved for a special day. Nancy’s daughter-in-law made it. It lasted just a few days in our freezer! Melt butter and brown sugar in small saucepan. Bring to boil stirring constantly. Boil for exactly 3 minutes. Remove from heat and add vanilla. Here are some tweaks I might try. Use light brown sugar and no salt butter, use dark chocolate and maybe melts some white chocolate and drizzle on top. Chopped golden raisins and or nuts pecan or walnuts mmm? But like I say, try it the cooks way first you should taste what they created. PS I did a quick Google search on the ingredients and found that this is similar to Saltine Butter/Cracker/nut Toffee so I admit it I grabbed a picture, this is something that I have to stay away from but it sounds soooooo good. 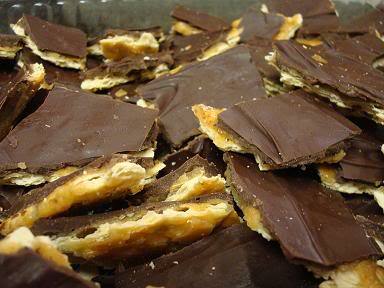 This entry was posted in Dessert, Appetizer and Snacks and tagged brown sugar, Butter, Chocolate chip, Saltine cracker. Bookmark the permalink.